The Steam Controller is an innovative take on classic gamepads. Gamers will likely appreciate the haptic feedback on the touchpads and deep levels of customization but, inversely, you might struggle with a steep learning curve right out of the gate. The Steam Controller sets out to do the impossible and comes very close to achieving its goal. Valve's latest peripheral intends to unite all genres of games, "to let you explore gaming's full back catalog — along with its bright future" (a quote taken directly from its website) and play the games that were originally made only for keyboard and mouse. And it really can play every genre of videogame, both old old games and new ones. It succeeds where others have feared to go, and to its credit, Valve came up with some novel solutions along the way. The Steam Controller has two trackpads on each side of the controller that pulse when your thumb moves along the surface creating a sense of control and letting you know how far away from the edge you are. Valve came up with two-stage triggers and added two extra buttons to the back to give gamers and game creators even more options than a standard controller, too. But the hardware is only the first step in the plan. Valve envisions a world where "standard, one-size-fits-all" control schemes no longer exist. If you don't want the jump command mapped to the A button, why should it be there? To that end Valve will enable all users and developers to upload their own control schemes to the Steam Store. Anyone will be able to upvote the ones they use the most, and hide the ones that don't make sense. It's crowd-sourced gaming and that, in essence, makes it a Valve product. But that brings us back to the question: Is the Steam Controller a better way to play PC games in the living room? Right now the answer is no. But that's going to change. Because even though I've tested the final product, the Steam Controller's journey has only just begun. Steam Controller: what is it? It's hard to believe how fast time passes. I can still remember the clamor and speculation the day Valve first announced it was not only producing its own operating system based on Linux and a line of gaming PCs - called Steam Machines - but would release its own controller as well. Like the original designs for the Steam Controller, SteamOS was interesting, if a little confusing at first. It's been over two years since that day, and in that time we've seen exactly one Steam Machine come to market (the Alienware Alpha) with 14 more en route for the holidays. But after the hype faded, the real questions began. When would the Steam Controller come out? What made it different than an Xbox 360 controller, which has become a standard for PC gaming? That's when we got the bad news: Steam's vision of the future would be delayed, and not for a few months but for a few years. The delay has been upsetting, to say the least. It's not all bad, though. The delayed release has given Valve time to refocus the controller, to redesign it with functionality - rather than novelty - in mind. The Steam Controller we're talking about today is smarter thanks to an improved software suite, more responsive thanks to the HD haptic touchpads and all-around more useable than the prototype models we saw a year and a half ago. It's one of three components of Valve's vision for the living room (SteamOS and Steam Machines are the other two parts), but as a trade-off for its inventiveness is limited to systems running Steam Big Picture Mode. Where the original version we saw had four square center buttons and lacked face buttons, the final product is reverse. The gamepad has 13 buttons, with seven on the front face and six in the rear. The front left is loaded with a control stick and haptic feedback-enabled touchpad, while the right side sports four familiar, colorful face buttons - A, B, X and Y - as well as another touchpad. In the middle are the Steam jewel, start and back buttons. The vast majority of the controller's face is dominated by two circular pads, wired for haptic feedback. The left pad, inscribed with a d-pad, could be used for custom commands - calling in airstrikes in Battlefield, for example - or movement in most games, while the right stick seems solely used for looking around and controlling the camera. They're made of plastic, as is the body of the controller, but have a smooth matte finish that makes it comfortable to run your fingers on top of. The one control stick has a concave top, and a rubberized grip not dissimilar to the Xbox One's thumbsticks. It's unsymmetrical without a second stick and left me with the feeling of a phantom limb anytime I went to reach for something that wasn't there. Spin it around to the back and you'll find a set of mushy, two-stage triggers, two bumpers and a hidden set of buttons where your fingers rest on the inside of the wings. The latter are something commonly found on aftermarket controllers from PDP or Mad Catz, but haven't found a home on first-party pads until recently with the Xbox Elite Wireless Controller. The bumpers sit on a plate that can be removed to put in the batteries, which makes for a rather unique design. I'm not sure I'm on-board with the decision of using standard AA batteries over rechargeable ones, but I can certainly understand the urge to keep costs low on a $60 controller. The wings are bulbous at the end and concave in the middle. It's a major departure from standard controller design and it's a polarizing decision. Some will find it easier to use a touchpad thanks to the way the wings raise the palms above the thumbs. Others will only comment on how hard the design makes it to press the face buttons. Inside the controller are gyroscope and accelerometer sensors that Valve claims will enable you to steer in some games. To my knowledge, there are no games that support either the gyroscope or accelerometer, but I'm sure it's a matter of time until someone capitalizes on the new functionality. Full disclosure: I've had the controller for around a month now. Valve delivered mine after getting a demo from its design team at its headquarters in Seattle, Washington. But this wasn't the first time I've used the Controller, nor was it the first time someone gave me a demo of it. During a closed-door demo at GDC 2015, I was able to play the pre-alpha version of the new Unreal Tournament using the Steam Controller. Gabe Newell was the one walking me through the demo. Surprisingly, for my first time in a new game and on new hardware, I fared better than expected. Using a touchpad to aim instead of a second stick took some getting used to, but with the help of what I believe was auto-aim assistance, I pulled through the fight with a slightly positive kill-to-death ratio. It wasn't perfect, however, and definitely didn't have the same intuitive feel that the original Unreal Tournament had with a mouse and keyboard all those years ago. Once I got the controller home, though, everything was different. Games I really liked to play with a standard controller - The Binding of Isaac and TowerFall - weren't any better with the Steam Controller. Now, that might not be true for other first-person shooters like Team Fortress 2 or Counter-Strike Global Offensive, or for someone who's had months and months of tinkering with control schemes, tweaking it until it's perfect. But everytime I put it head-to-head against a standard Xbox 360 controller, Microsoft's stock gamepad came out ahead. The other problem you might face are strange incompatibilities with other gamepads - I've heard of a few instances where using both an Xbox 360 gamepad and a Steam Controller confused the PC, or times when Steam Big Picture Mode treated the Controller like a less functional mouse instead of a controller. At this point all you can do is report those instances when they come up, and work with Valve while they scan and patch every one of the thousands of games on the service. What is encouraging, though, is that so far only a small portion of the Steam community have used the controller, which means there wasn't much diversity between control schemes. To elaborate: While Valve's Steam Controller will likely be better suited to certain genres over others, that doesn't mean that someone won't come up with something brilliant and game changing. When the Steam Controller becomes a standard gamepad in player's living rooms, gamers will be able to create their own custom control schemes, save them to their Steam profiles, export and share them with the Steam Community. Other Steamers will be able download these player-made setups, and Valve will highlight the most popular ones in the community. It could be that a fan-made setup will beat out an official one. How's that for player feedback? This also removes the impetus from developers to come up with the best control scheme right out of the gate - a boon for them while we're all still getting used to the new technology. So just how deep does the customization software go? Pretty darn deep. Each button can be held down for a turbo effect. Any button can be held down to enable mode-shifting, allowing you to assign new commands to every other button. Steam will save your personal control schemes you create, as well as show you templates for other popular styles. The software is a figurative rabbit hole, so to speak, that some gamers have searched their entire lives for. In practice this means you can map a jump button to the left pad on the back of the controller, or reload to the right-thumbpad down click. It can get insanely complicated if you let it, and for some it's everything they've been waiting for. While I still haven't completely acclimated to them, I do like and see the potential in the two touchpads. Haptic feedback was the missing component at the beginning of development and, now that it's there, the pads feels complete and natural. While I personally haven't unlocked the potential accuracy of the pads, someone somewhere out there will. Speaking of untapped potential, the platform itself is full of it - it's still well into its infancy. Infancy doesn't even feel like the right word here, however, as the system has literally just come to the market and is entirely dependent on the community building it into something great. The overall design of the controller is awkward. There's just no way of getting around it. 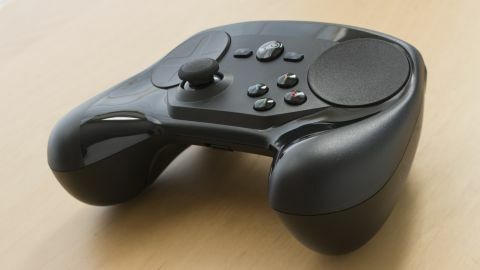 Bulbous wings make the Steam Controller awkward to hold and worse, make it difficult to reach the A,B,X,Y face buttons if you have small hands. The two-stage triggers are a neat concept, but are ultimately mushy and lack the same excellent ergonomics of hair triggers. The other elephant in the room is that the controller still feels like a novelty rather than a potentially dangerous gaming accessory. I had the best time with the controller trying to do something weird and wacky with it - like remapping button bindings to random commands - than I did trying to compete seriously with it. The Steam Controller is a living, changing peripheral that's just as likely to revolutionize and improve the way you game as it is to frustrate you when using it for the first time. But it's different, and that's OK. Currently different means that the Steam Controller is more of a novelty than a practical, battle-ready gamepad - which, if you're looking for that, check out the Xbox Elite Wireless Controller - and some of your best moments with the controller will be trying out all the wacky control schemes the community cooks up. If Valve knows how to do one thing, it's build a platform. Consider these first few weeks after launch a trial run. Give the controller and the community some time to build out the functionality and there's no telling where the Steam ecosystem will take you. Until you decide you can stand a few glitches and incompatibilities, not to mention the overall lack of competitiveness of the controller, I'd recommend sticking to what you know works - whether that's a keyboard and mouse or another type of controller. If you're willing to see what the platform has in store, add to the ground floor of Valve's next big idea and think outside of the (orange) box, this controller could be the very thing your thumbs have been aching for.